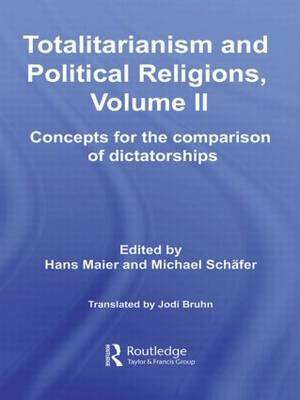 Available for the first time in English language translation, this is the long-awaited second volume of the three part set on Totalitarianism and Political Religions, edited by the eminent Professor Hans Maier. This represents a major study, with contributions from leading scholars of political extremism, sociology and modern history, the book shows how new models for understanding political history arose from the experience of modern despotic regimes. We are used to distinguishing the despotic regimes of the twentieth century - Communism, Fascism, National Socialism, Maoism - very precisely according to place and time, origins and influences. But what should we call that which they have in common? On this question, there has been, and still is, a passionate debate. Indeed, the question seemed for a long time not even to be admissible. Clearly this state of affairs is unsatisfactory. The debate has been renewed in the past few years. After the collapse of the communist systems in Central, East and Southern Europe, a (scarcely surveyable) mass of archival material has become available. Following the lead of Fascism and National Socialism, communist and socialist regimes throughout the world now belong to the historical past as well. This leads to the resumption of old questions: what place do modern despotisms assume in the history of the twentieth century? What is their relation to one another? Should they be captured using traditional concepts - autocracy, tyranny, despotism, dictatorship - or are new concepts required? Here, the most important concepts - totalitarianism and political religions - are discussed and tested in terms of their usefulness. This set of volumes is as topical and relevant to current world events in the twenty first century.